Today, I harvested the last of our potato crop. The proprietor of Seattle's wonderful Portage Bay Grange told me that as long as you get 6 hours of sunlight a day, you can survive with nothing but a potato patch and a goat. Potatoes have carbs and Vitamin C, and goat milk has fat and protein. Plus, goats can eat potatoes. 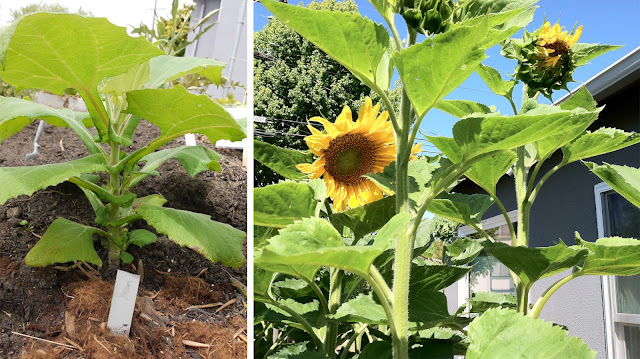 I like a little more variety, and El Cerrito's rules on backyard livestock don't yet allow full-time dairy goats, but I have to say, I'm sold on growing my own potatoes. 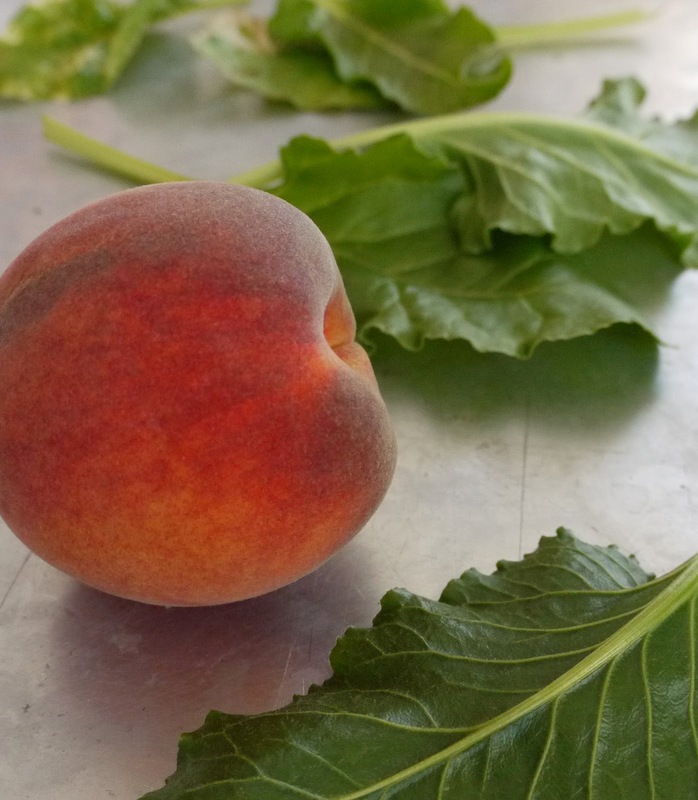 Mealy, bland peaches are disappointing. 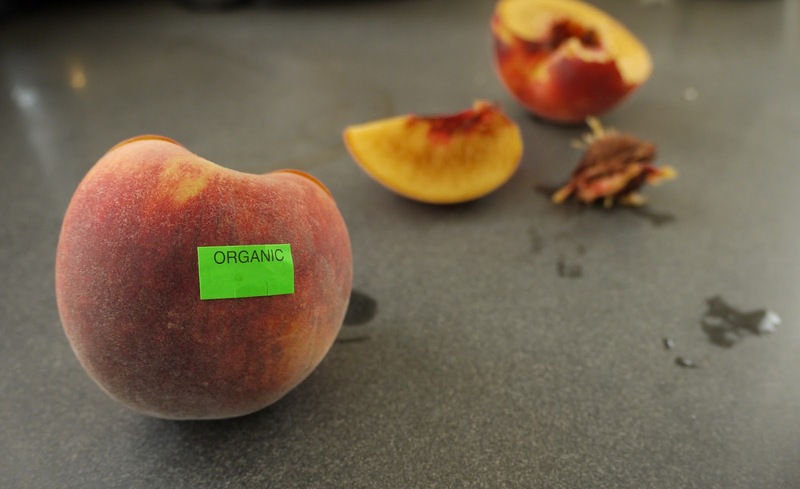 Peaches that are organic, in season, grown by a well-respected regional grower, locally purchased, beautiful and delicious-smelling, which then turn out to be mealy and bland, are just wrong. Particularly when you bought a half-dozen of them at the premium organic fancy regional grower price. Remember the evil tomatoes? 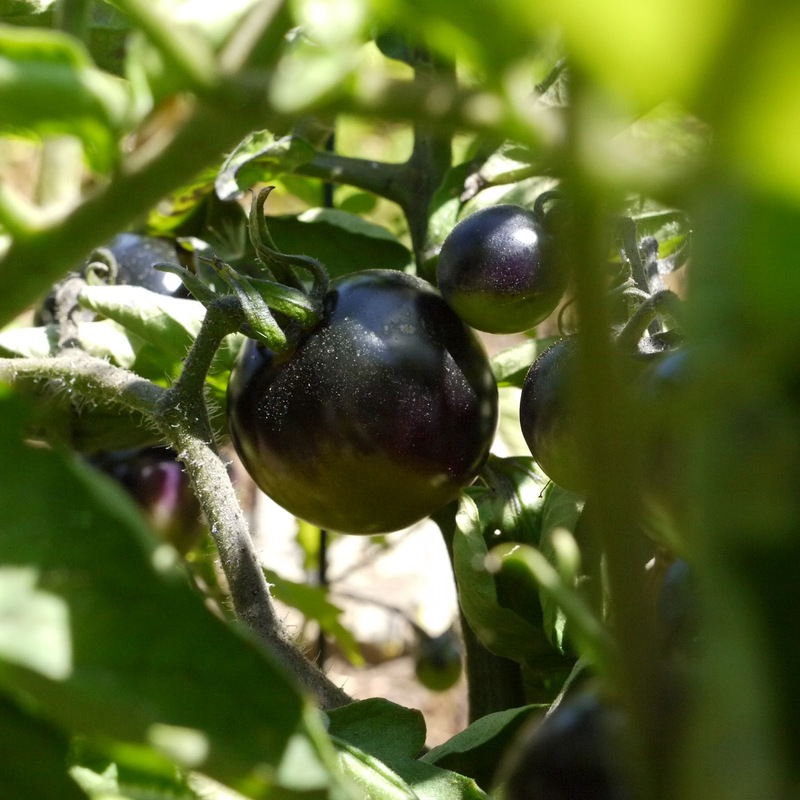 For months, people have been asking, "Are those black tomatoes?" and "What do they taste like?" and I've been answering, "Yes," and "I don't know, they're not ripe yet." We've been eagerly discussing whether they'll taste just like other tomatoes, or if they'll have some complex flavor befitting their dramatic appearance. Well, friends, the Indigo Rose tomatoes are finally showing signs of ripening. And they still taste lousy. Either it's still too early, or I'm doing something very, very wrong with my watering, or the folks at Oregon State still have a lot of work to do. These last ones are better than the even less ripe ones I tried earlier, but there's no intense tomato flavor, no sweetness, no acidity — they're just bland and a little mealy. I'm really hoping they'll improve over the next weeks. If not, I may follow a friend's suggestion and use them while they're still unripe, sautéed in olive oil. I hear you can also make green tomatoes into chutney, pies, pickles, and cakes. While the cake concept seems a little questionable, I may have to try the chutney and pickles just because they'll look so damn beautiful. Anyone got a good green tomato chutney recipe? Look! It's our very first pepper! 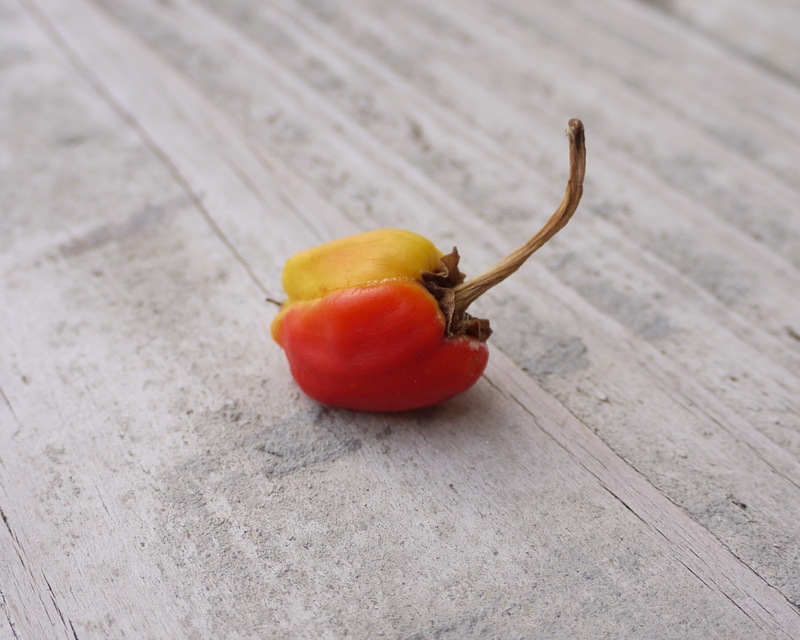 I know, most of you have probably been harvesting giant shiny beautiful peppers for months. Not me. I planted pepper seeds that I got for free at the seed swap, and none of them came up. So I bought pepper seeds from the nursery and planted those. A few came up, then they died. By the time I gave up and just bought seedlings, it was very late in the season. I may have left it on the plant a bit too long. I was hoping it would grow more. It's only about an inch long, and the tag said 3 to 5 inches. Of course, the tag also said "very sweet" and "wonderful flavor," neither of which are true of this sad little specimen. There are still a bunch of green peppers still on the plant, though. We'll wait and see how they turn out before passing judgment on the variety. 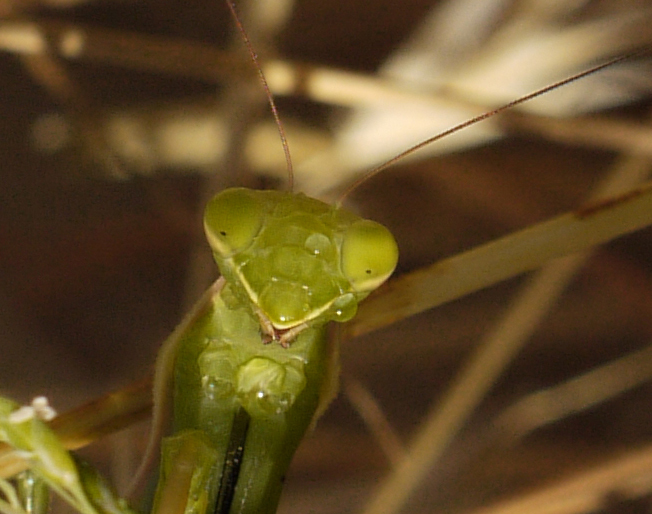 I just saw a praying mantis in the back yard. This is by far the coolest critter to visit our garden so far. This is exciting for several reasons. 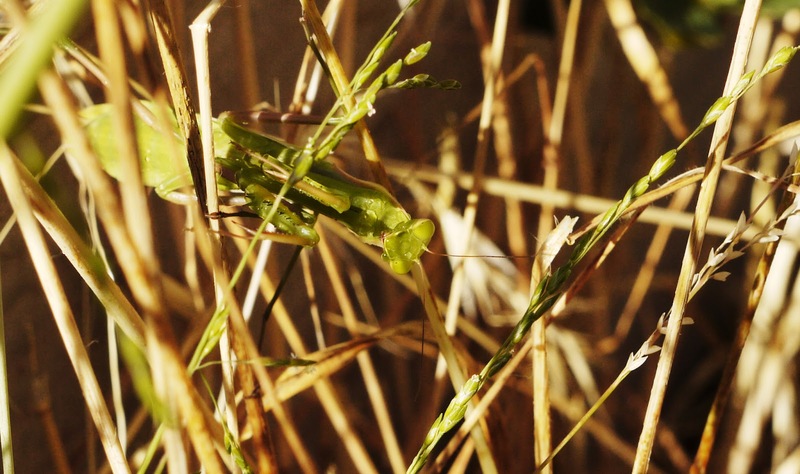 First, I've never seen a praying mantis "in the wild." That is, not in a terrarium or a garden center refrigerator, next to plastic cups full of ladybugs. 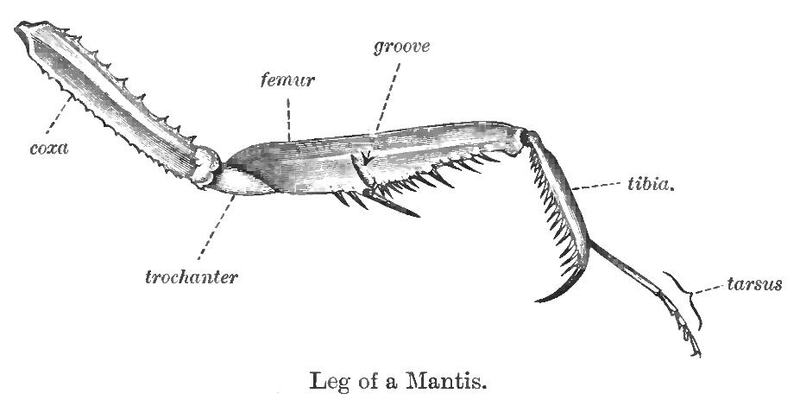 Second, praying mantises are just generally badass, what with the spiky hands and the super vision and the postcoital cannibalism. Third, they're voracious predators. And I'm a big fan of anything that eats the bugs that eat my garden. I was watering the strawberry bed and then there she was, climbing out of the plants. I ran for the camera and came back to find her in no particular hurry. She made her way over to the edge of the garden bed, climbed onto some nearby grass, and hung out, licking her paws. Or whatever you call the spikey things at the end of her arms. 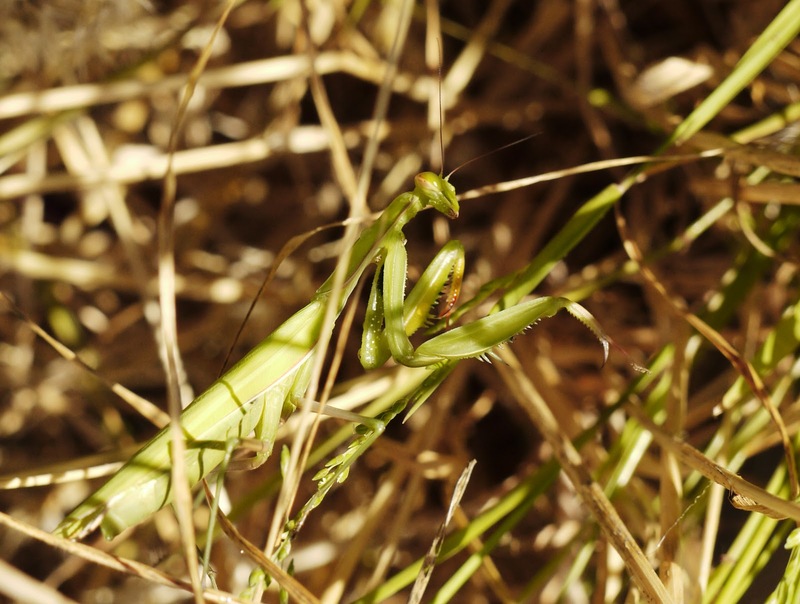 Anyone else seen praying mantises in their gardens? 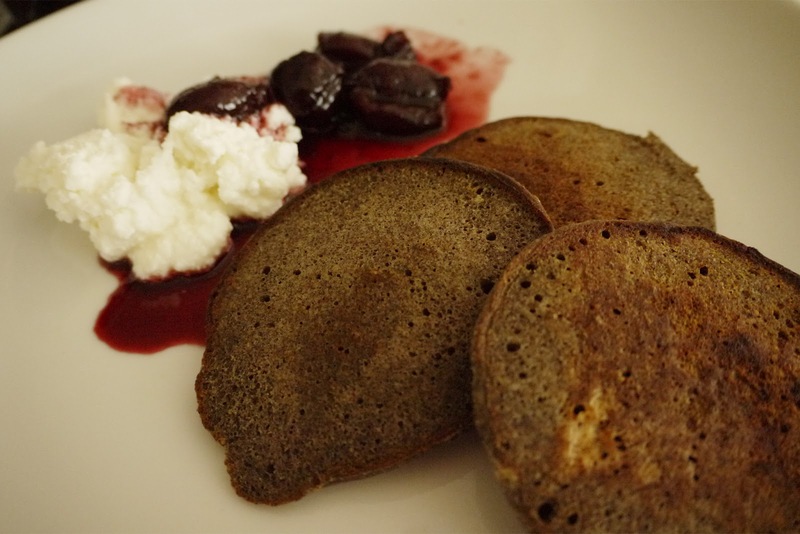 While buckwheat crepes are traditionally served with savory toppings, these buckwheat pancakes went perfectly with the creamy ricotta cheese and the sweet/tart balsamic cherry preserves I made last week. It's worth using the good, fresh ricotta cheese. I've come to the decision that the low-fat stuff isn't worth buying – the texture is terrible, and the actual difference in calories is almost nil. Buckwheat (not actually a kind of wheat) is a favorite ingredient of mine — it has a nice hearty texture and a more earthy flavor than wheat. It's gluten-free, which is a plus when I'm cooking for my GF friends. Although most recipes call for buckwheat flour to be mixed with wheat flour, I've had good success using buckwheat flour alone in pancakes and quick breads. I don't really use a recipe for my pancakes. It's rare that I even use measuring cups or spoons. I eyeball proportions, shaking flour straight from the sack into the bowl and grabbing handfuls of sugar. I use all different kinds of flours and milk-like liquids (soy milk, almond milk, kefir...), substituting according to whim or availability. I stir, then add more liquid if it seems necessary. None of these are recommended techniques. If I were more scientific about my substitutions, I would pay attention and figure out the right compensations to make. 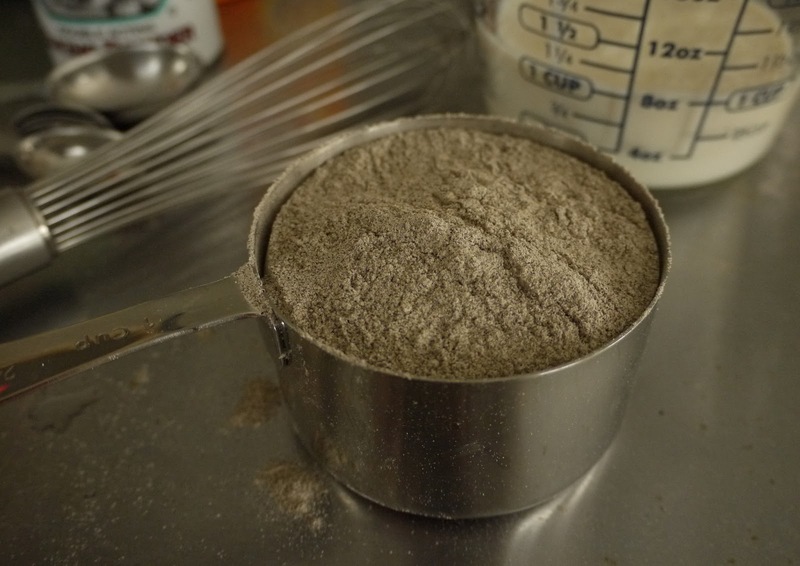 Things like what adjustments to make for heavier or gluten-free flours. Or how I should change the of baking powder or baking soda if I'm replacing a pH-neutral milk or nondairy milk with an acidic kefir, buttermilk, or yogurt. Things like that. I don't do the science when I'm cooking, which means that my results vary quite a bit. Sometimes my pancakes are thick and fluffy. Other times they're nearly as thin as crepes. Both of these are good. Occasionally I estimate wrong and the batter is too heavy (or the leavening too weak) to form the bubbles that give pancakes their lightness. The pancakes are thick and heavy, and the insides never quite cook properly. When this happens I serve them with really juicy toppings, which soak into the pancakes and make the gooeyness less obvious. If anyone complains, I invite them to make their own damn pancakes. For this batch, I separated the eggs and whisked the whites before folding them into the batter, which probably helped make the pancakes lighter but is more trouble than I'm generally willing to go through before I've had my coffee. For the liquid, I used half kefir and half soy milk, but you could almost certainly get away with just using milk. Mix the liquids (milk, eggs, butter) into the dry ingredients. It's okay if it's lumpy. Gently fold the egg whites. A huge bag of cherries for 49 cents seemed a potentially unwise purchase, but I figured the worst case was they'd all go in the compost. About a quarter were mush, but plenty of them were fine. After eating all the perfect ones and tossing the mushy ones I still had 2 quarts of sweet, slightly overripe cherries left. 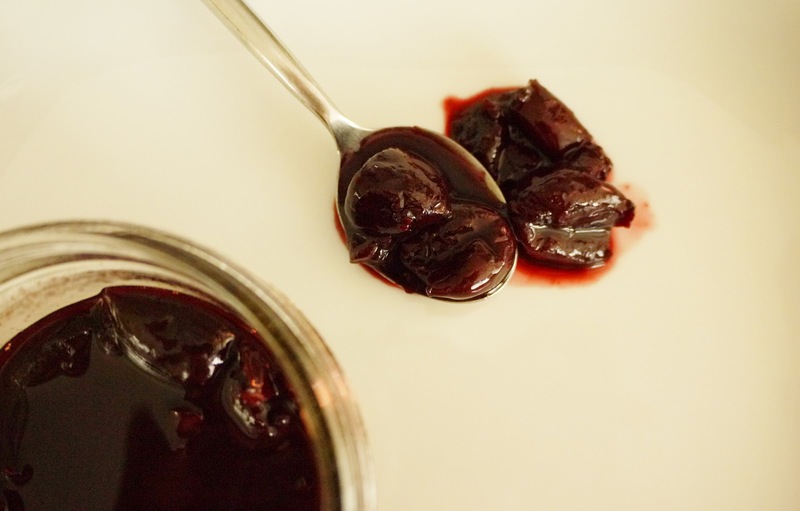 Pie came to mind, but a quick browse through the internet turned up nomnivorous.com and an intriguing recipe for balsamic-preserved cherries. I'm generally not much for vinegar-based preserves, but I do enjoy balsamic vinegar reduction, so this concept had potential. Also, Emily's photos looked very tasty. My fancy cherry pitter and a stockpot full of pitted cherries. Unusually for me, I actually followed the recipe pretty closely. It didn't seem quite thick enough, so after the cherries had cooked for 20 minutes I strained out the fruit and set it aside, and reduced the liquid by about 1/3, then put the fruit back in. If I were doing it again, I think I'd reduce the liquid further, or maybe add a tiny little bit of pectin. If you want to bring me a giant bag of cherries, I'll try it and let you know. 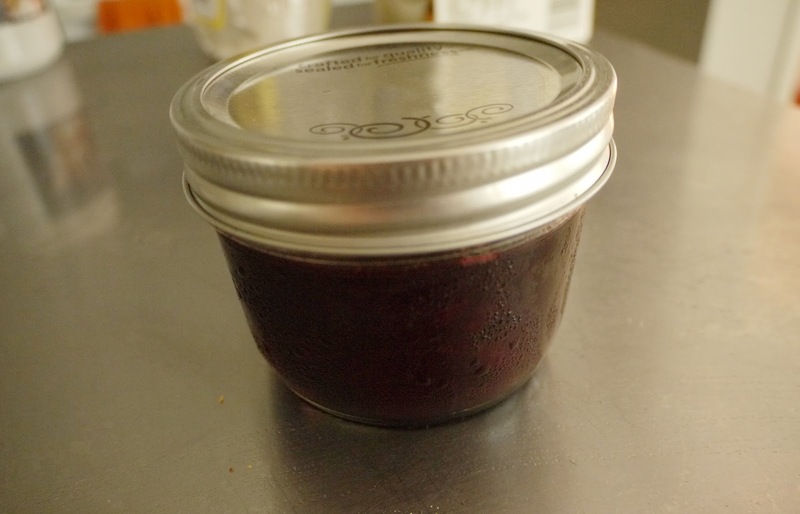 2 quarts of cherries gave me almost six half-pint jars of preserves. While I normally steer clear of marked-down produce, this bag of mushrooms appealed to me. 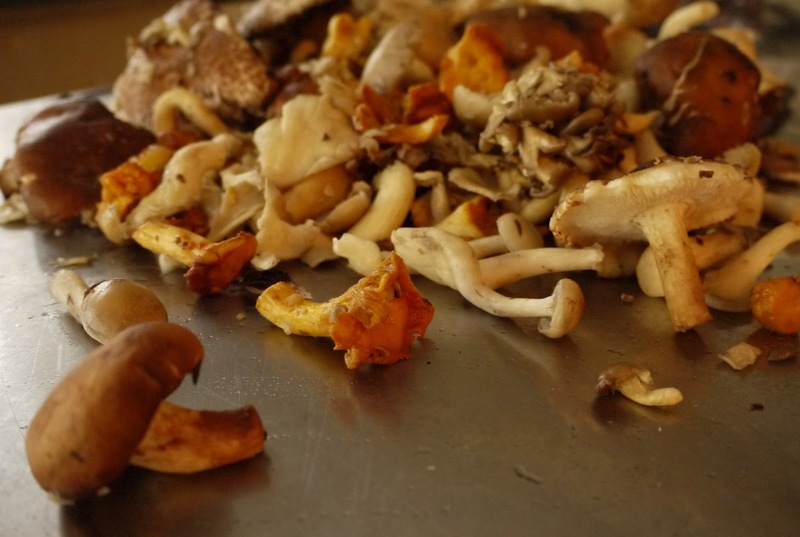 They were bruised and broken, the bits left at the bottom of the bins in Monterey Market's mushroom aisle, cleared out to make way for fresher specimens. This mix had cremini, porcini, shiitake, and portobello mushrooms, which I use semi-regularly, plus the strange and lovely varieties I don't usually get because they're pricey and I'm not sure what to do with them: lobsters, chanterelles, oysters, shimejis, and others I can't identify. At home, I rinsed them off (I know many people say not to, but they were dirty and I knew I'd be cooking them down), photographed them, and then debated what to make with them. Initially I planned to saute them in a little butter, slowly cook them down, and toss them with a whole-grain pasta. While I think that would have been delicious, I've also been wanting to try and come up with a vegetarian stock with more umami and less sweetness than most of the root vegetable-based ones I've tried. Consulted a half-dozen recipes, averaged them, and dumped the mushrooms into the stockpot with a little butter, salt, and a few cups of water. Simmered a while, realized I should have chopped them more finely, and used the immersion blender to remedy that. 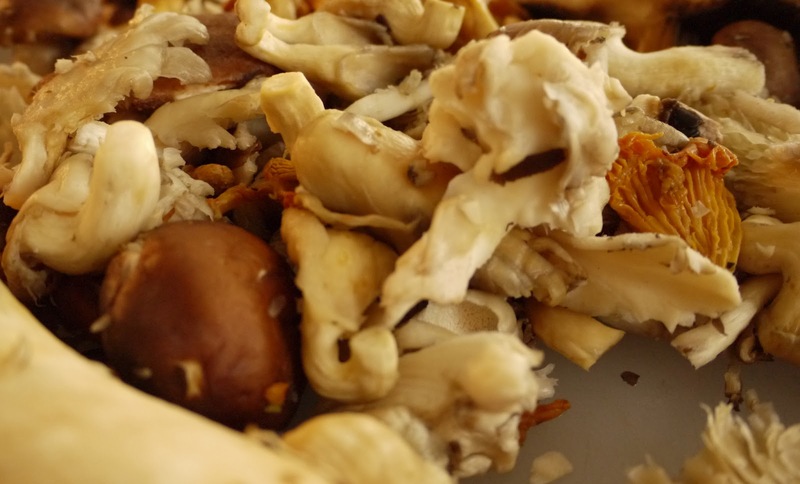 Re-consulted the internet and realized that the woody shiitake mushroom stems shouldn't really be eaten, but were now too finely blended with the other bits to really pick out. Simmered some more and strained, saving the liquid for soup and putting the squeezed-out solids into a bowl with the idea that I might make duxelles. Mince up a bunch of mushroom bits, stems, etc. 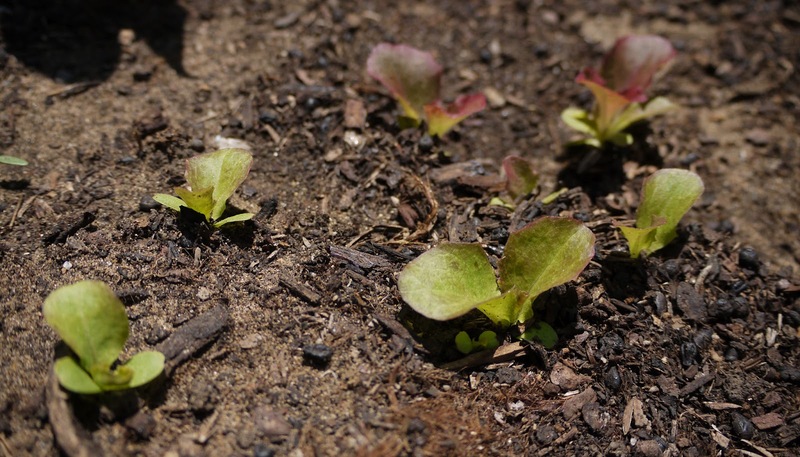 For instant gratification, there's nothing like nursery six-packs of lettuce seedlings. Of course, they're very tiny, and the nursery will have a number of exciting varieties, so you'll probably bring home several six-packs. You will plant them, water them, pick a handful of little leaves and post pictures of your first tiny home-grown salad on Facebook. Lettuce seedlings from the nursery, because I'm into instant gratification. This is what I do every spring. Soon, I have more lettuce than I really want. I encourage guests to take bags of lettuce home, bring salads to parties, and start giving bags of lettuce to family, friends, and any passers-by who express an interest. Just about to flower. The beginner guide to seed saving from the seed lending library RichmondGrowsSeeds.org says, "Let lettuce bolt. When half the flowers have turned white and fluffy, cut off the stalk and put upside down in a brown paper bag to dry. Remove chaff." This lasts a few more weeks before the lettuce starts to bolt. I step up my harvesting, trying to keep ahead of nature. Grilled lettuce and lettuce soup start sounding like reasonable ideas. Then the whole lettuce patch goes to seed. I am finally coming to terms with the fact that lettuce is not one of those plants you can stick in the ground in spring and harvest continuously until winter. It has a finite lifespan. No matter how well I water it, how diligently I harvest it, it will eventually get all tall and spindly and bitter. The sensible thing to do here would be to start planting a half-dozen lettuces every month or so, ensuring a constant supply of tender young greens, and letting me feel okay about ripping up and composting any plants that start to go to seed. Instead I've planted a dense, 10-foot by 18-inch strip of greens (mâche, assorted lettuce, assorted braising greens, spinach, and miner's lettuce), plus a mixed-variety six-pack of seedlings I picked up at the nursery. I hear lettuce soup is really quite tasty. New baby lettuces, planted from seed about two weeks ago. After the wild success of the potato experiment, I rushed to the nursery to see if I could get a second crop in. This late in the season, they had no more seed potatoes, but told me I could probably do fine with supermarket potatoes, as long as they weren't treated. 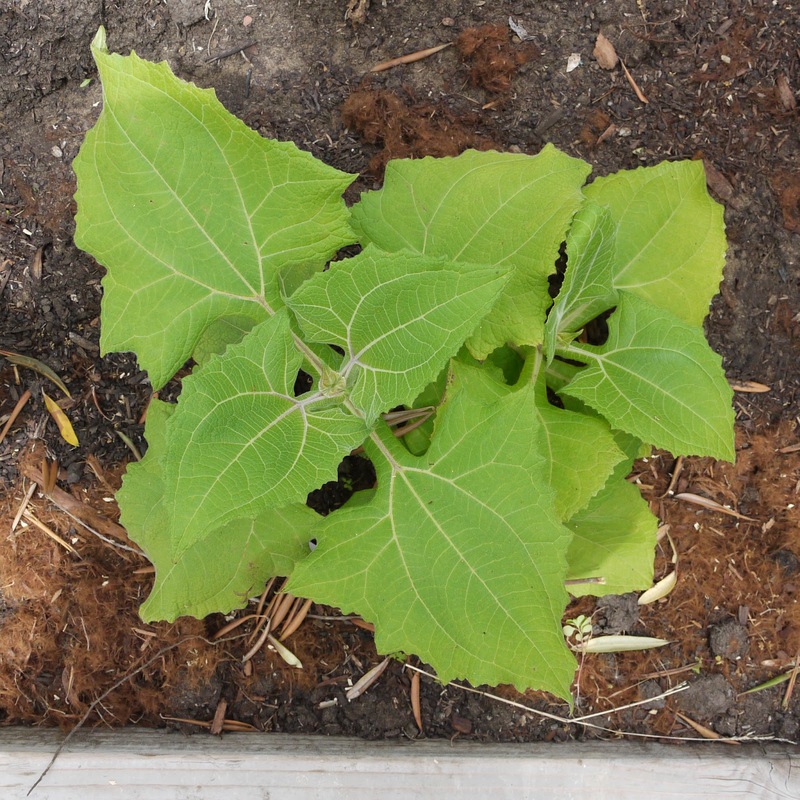 As long as I was there, I wandered around to see if there was anything else I might want to grow, and found Yacón: a relative of the sunflower, grown for its edible tubers. Not quite a potato, but definitely worth trying. 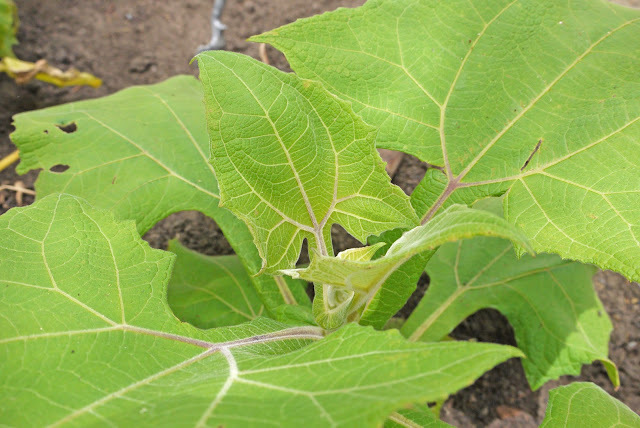 Yacón, also known as "Peruvian ground apple." What part do you eat? 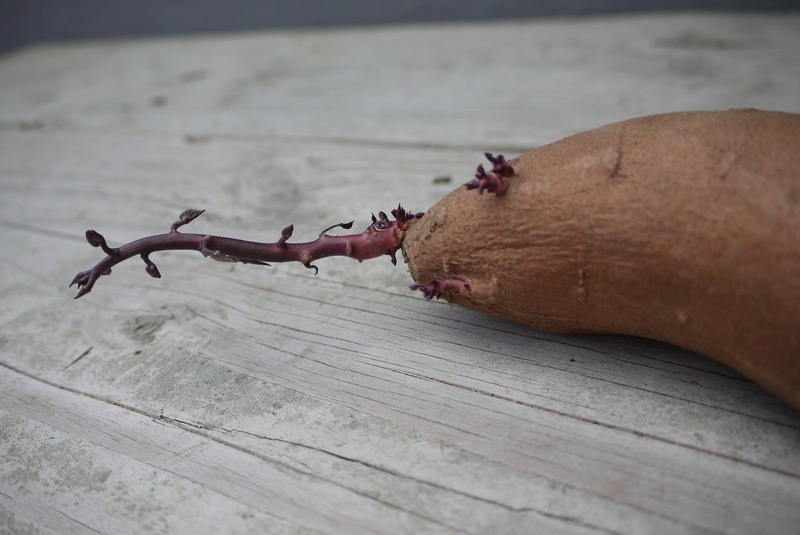 Edible tubers grow underground, like potatoes. They taste kind of like apples, or jicama. You can eat them raw or cooked. Yacón is related to the sunflower. 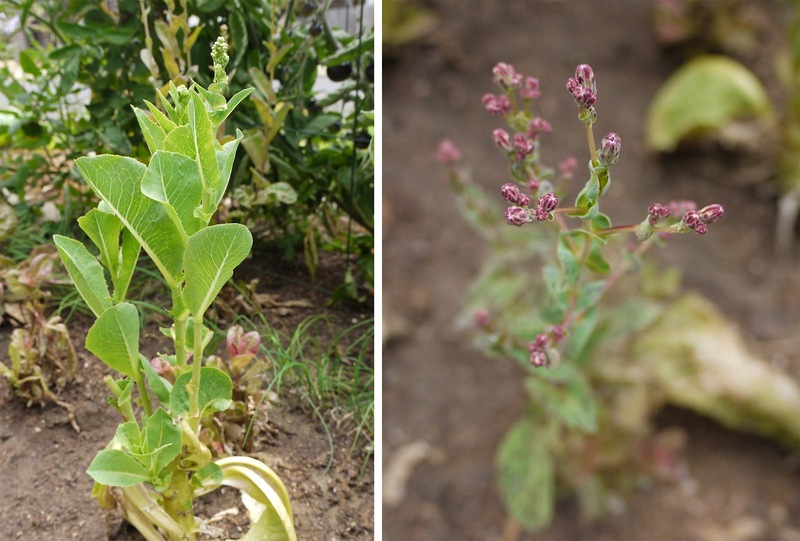 No word on whether its flowers produce edible seeds, though one web site said it had been cultivated by dividing the root cluster for so many generations that it no longer produces viable pollen or seeds. Yacón is native to South America. 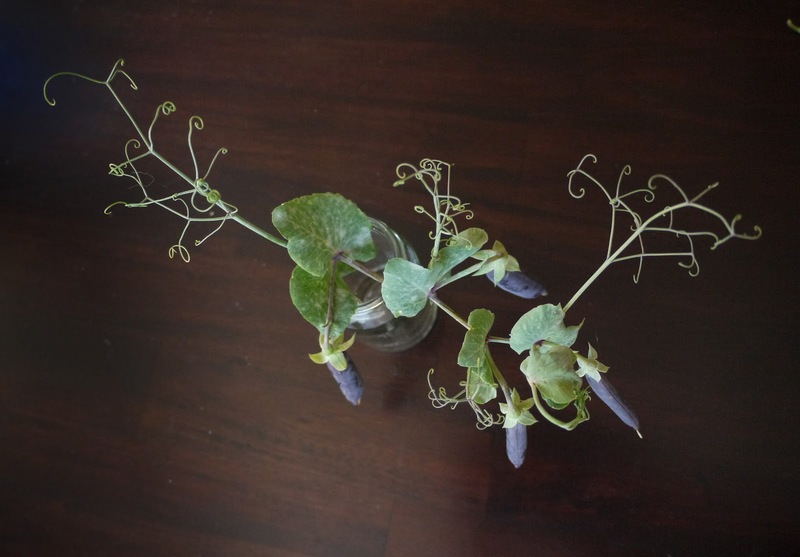 I bought these plants as seedlings from Berkeley Horticultural Nursery. Is that a black tomato? Yes. The variety is called "Indigo Rose." It gets its color from anthocyanins, the same antioxidants that make blueberries blue. How do you know when it’s ripe? If you look carefully, some of the tomatoes have green patches where they were shaded from the sun. 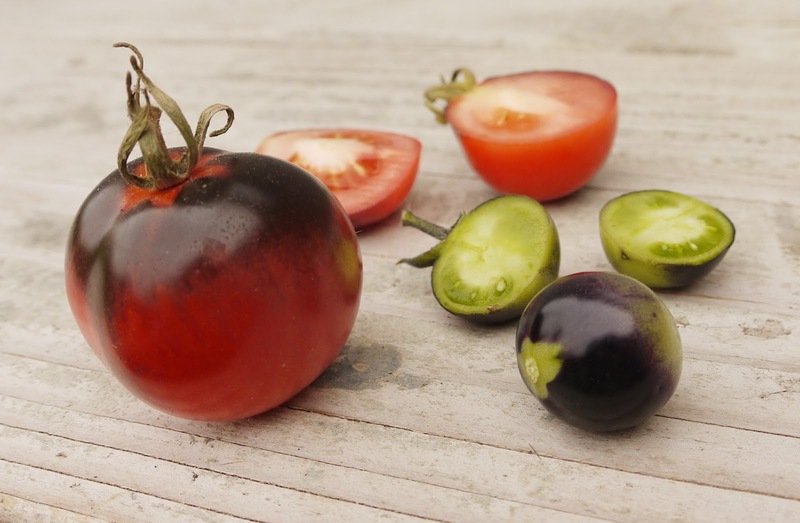 When the tomato is ripe, those green patches will turn red, and the rest of the skin will change from the dark black to a slightly brighter purple color. 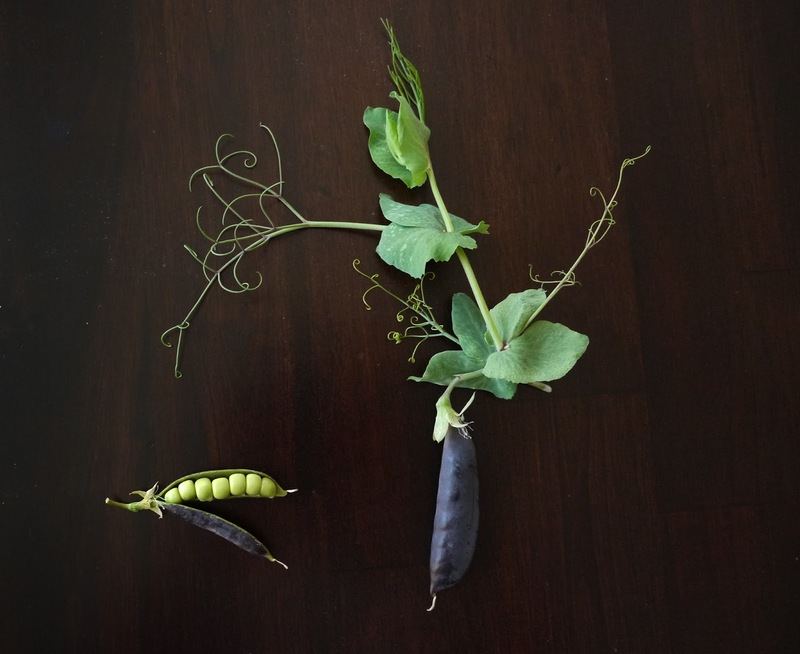 I don't know – this is the first time I've grown this variety. Is it a real tomato? Is it GMO? Is it a hybrid? It is a real tomato, and it's not GMO or hybrid. In fact, it's open-pollinated. (That means that if you let the plant pollinate itself and then plant the seeds, the plant that grows will be the same as the parent. 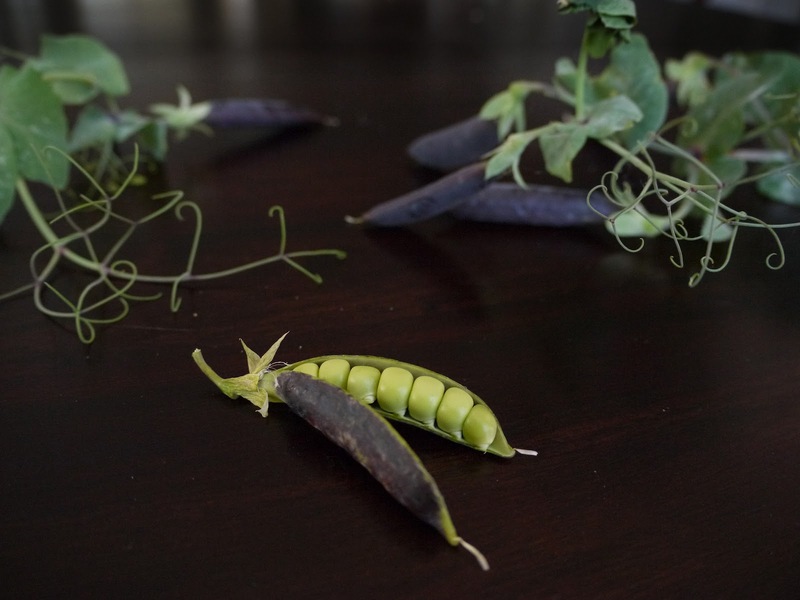 You can't do that with GMO or hybrids – you have to buy new seeds every year. Indigo Rose was developed by vegetable breeders at Oregon State University using traditional methods. 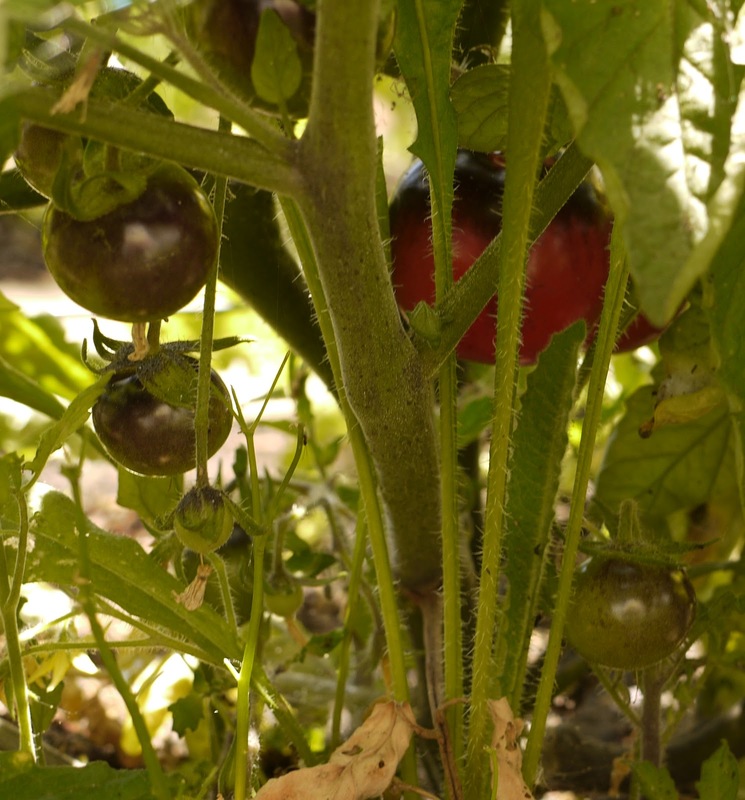 Many kinds of tomatoes contain small amounts of natural anthocyanins in their leaves and stems. 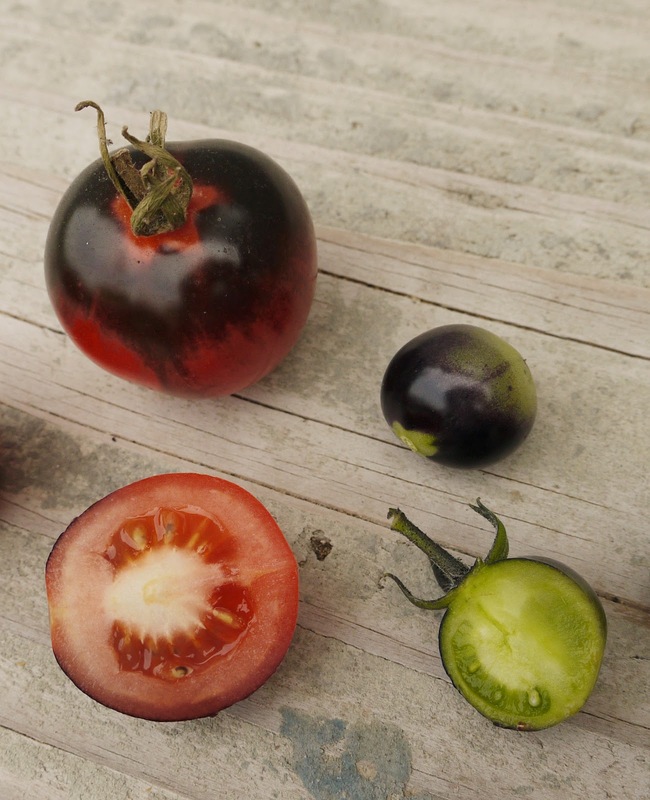 Some wild tomatoes from Chile and the Galapagos Islands had small amounts of the purple pigment in their fruit, too. 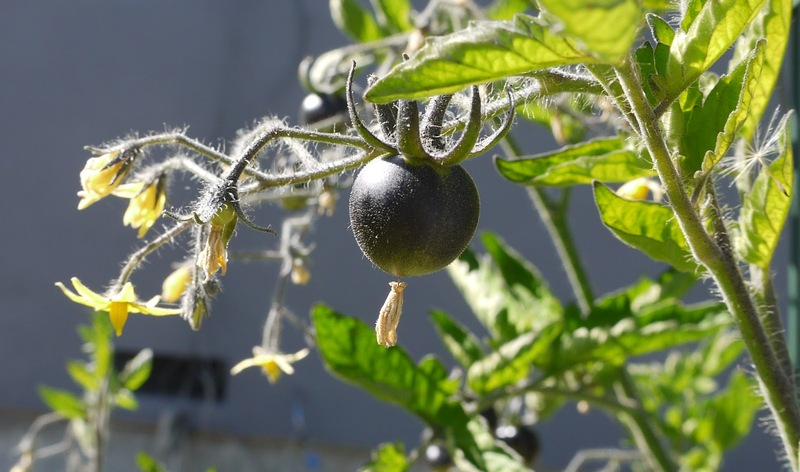 The OSU breeders took tomatoes from these lines, cross-pollinated them, and chose the purplest of the offspring to be the parents of the next generation. 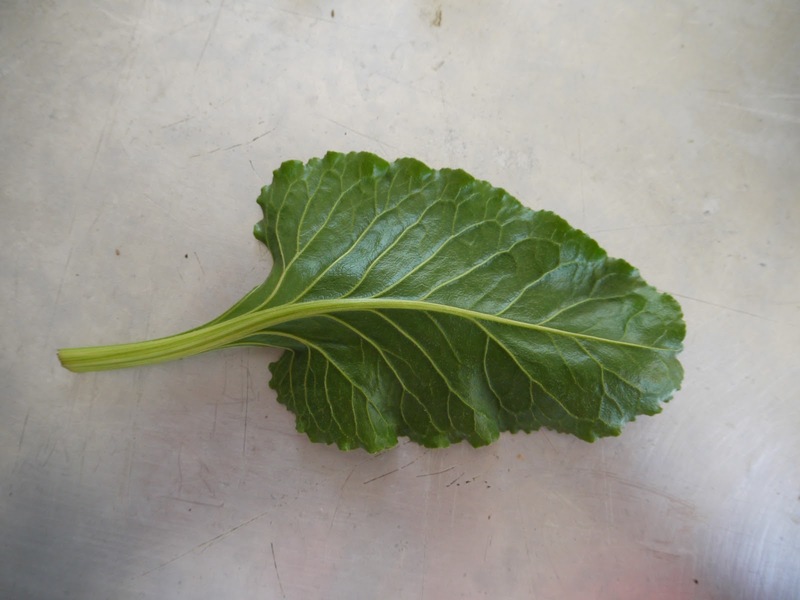 Labels: FAQ, garden, tomato, What's that plant? I believe this is a japanese sweet potato from El Cerrito Natural Grocery but I can't be certain, as it's been languishing in the corner of our kitchen for many weeks. Since it managed all this growth in such an inhospitable environment, I expect great things now that I have tucked it into a nice section of the garden bed. As I was planting this, a neighbor walked by and remarked, "Sweet." Yes indeed. Labels: garden, sweet potato, What's that plant?